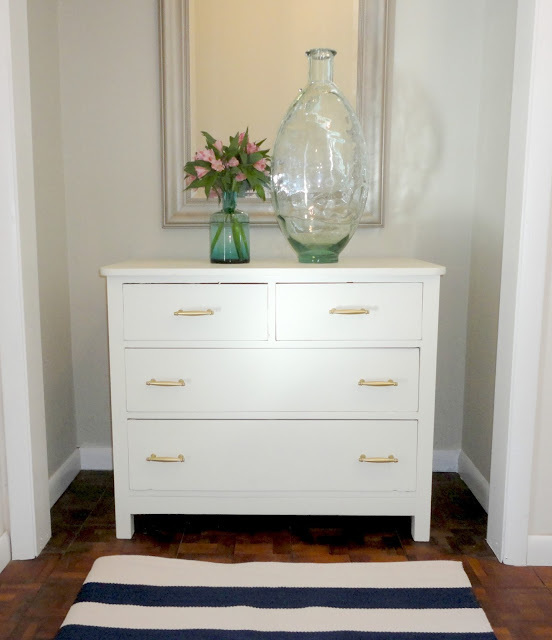 LiveLoveDIY: Entryway Makeover & A Giveaway! 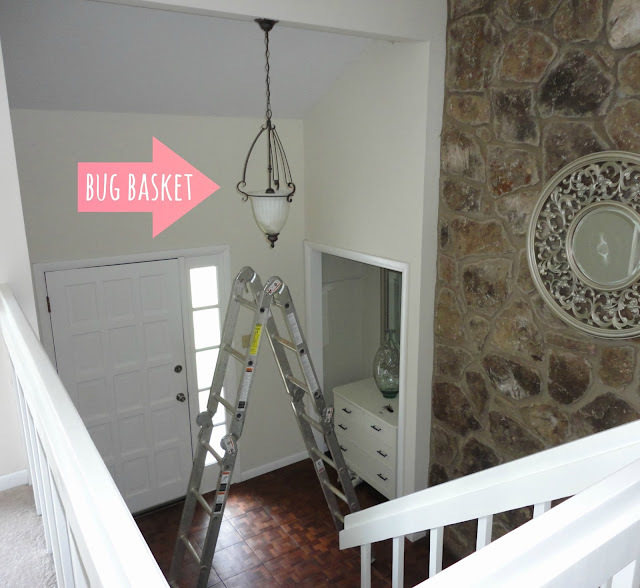 Entryway Makeover & A Giveaway! We still have so much work left to do on our house, but sometimes it just isn't feasible to tackle a big project yet. In the meantime, I try to focus on the little things that I can change, and work towards the big picture. 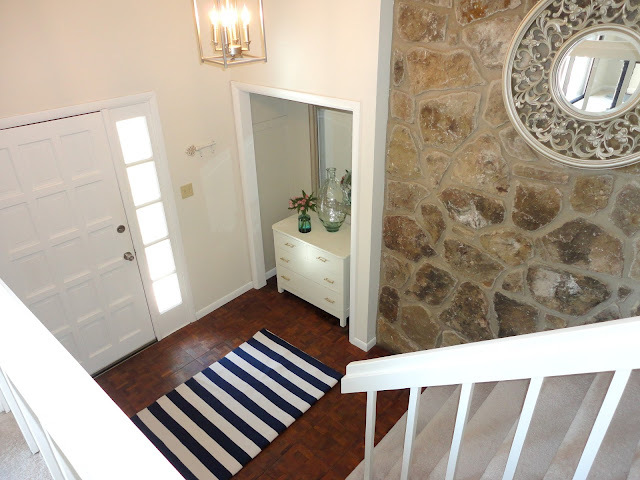 This weekend, we made a few small changes in our entryway, and I'm so happy with our little mini makeover! It was just three years ago that the foyer was a sad little place filled with outdated wood trim and an undersized pendant. Just a month after we moved in, the first thing I did was paint the trim. This was the first room I ever painted, so I didn't know much. I just read a few tutorials and dived in. I've since learned how to avoid the mini-dustbowl I created in the below picture. I live and I learn. After the trim was finally painted, I showed off my decorating prowess by creating this masterpiece in the closet nook. As I demonstrated earlier this month, I've made more than my fair share of decorating mistakes. 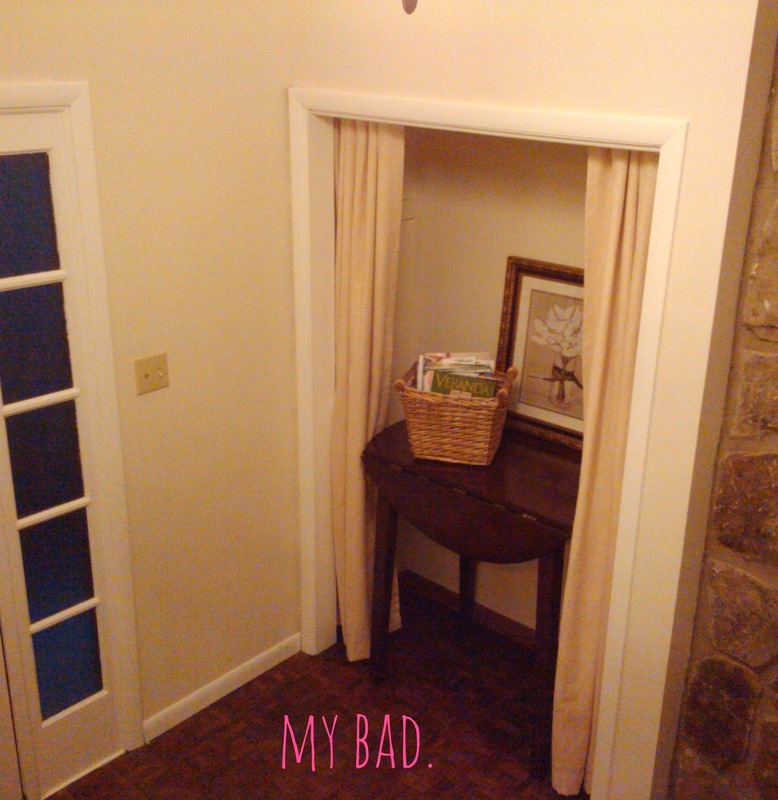 I had some decent ideas in the beginning (like removing the coat closet doors to create a nook), but my execution was a bit lackluster (queue above picture). I kept working on it though, and eventually the space improved a little. I painted an old wooden dresser and added some better accessories. It stayed like that for about a year, and then the decor in the rest of the house began changing and the bronze stuff began to feel a bit dated. We've freshened up this space quite a bit. 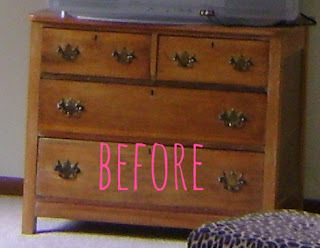 About a year ago, I painted the nook with a light gray-green color, and I decided to paint an old wood dresser white. Originally, the dresser had black handles and dark gold accessories (seen here), but I decided to freshen it up a bit by bringing in a silver mirror, aqua glass accessories, and then I decided to spray paint the handles with some gold spray paint. The little pop of gold goes a long way in person, and totally glams up this space. Spray painting tips can be found here. Now let's talk about the floor situation for a minute. Our current situation is much more parque/carpet, but the above picture helps provide me with inspiration for this space. New floors will probably become a reality sometime in the next 6 months, so I've been thinking a lot about what type of floors we want. 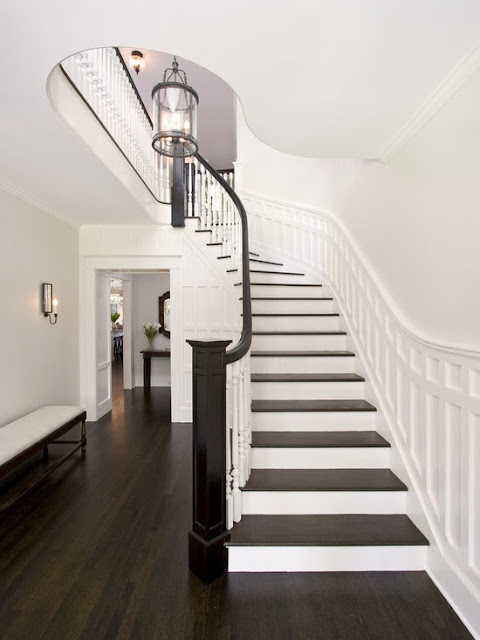 Jesse helped me photoshop our foyer with a few colors, and I'm going back and forth between really dark and something like this. I totally let out a little squeak when he showed me this picture, as it's so fun for me to see what it might look like. So, I think I've kinda narrowed down the color, but I have no idea about anything else. I've got 6 months to torture myself with the specifics. Anyone have any hardwood tips for me? Like what you wish you would have known before you got your floors? I'd love to hear your experience or any suggestions you might have. And until then, my current floors will hide themselves under my awesome striped rug. And now for my favorite update to the entryway! We finally got rid of the tiny pendant that I've grown to despise after watching it accumulate bugs for years. I've spent a lot of time looking for a chandelier that would be perfect for this space, and I finally found what I was looking for. 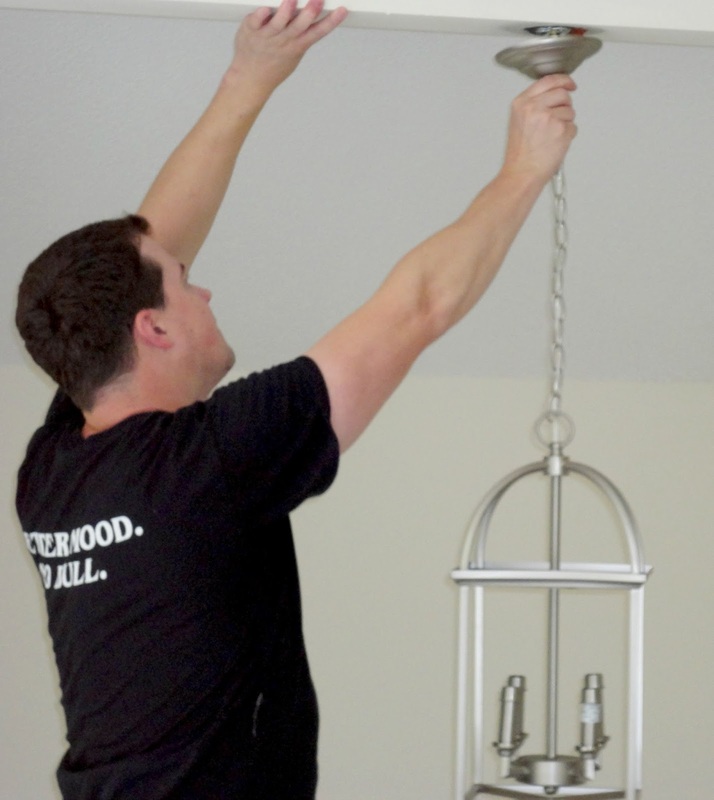 I absolutely fell in love with the Piedmont chandelier from National Builder Supply. It's the perfect blend of sleek and simple I've been searching for. And I think it looks so great in this space. Of course, I had my handyman install it for me, per usual. He's promised to teach me to do this on my own soon, so that I can share it with you. He thought about teaching me a few things this time around, and I basically looked at him like he was crazy. Not because I'm not eager to learn, but because this fixture is hung 20 feet in the air. And my tiny stepladder (also known as 'This is as high as I go.') quickly proved that I wasn't the guy for the job. So, that's where the entryway is today. Little by little, we're making progress! And now, because ya'll are awesome, National Builder Supply is giving away $100 credit on their site to one lucky winner! They have a bunch of really great products for the kitchen and bath, and you can browse their site here. Please enter via the Rafflecopter widget below. This post was sponsored by National Builder Supply. 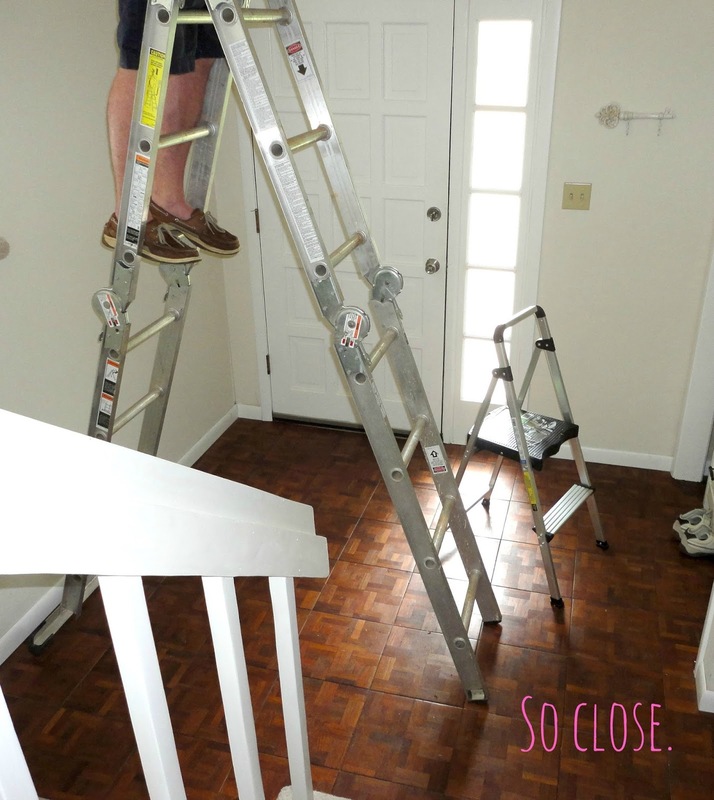 I did a real out-loud laugh at your stepladder-versus-actual-ladder photo. Andy keeps trying to psychoanalyze me and figure out what happened in my childhood to create my own fear of ladders, but I maintain that I am just a sane person with a reasonable fear of falling from heights I'm not made to reach. 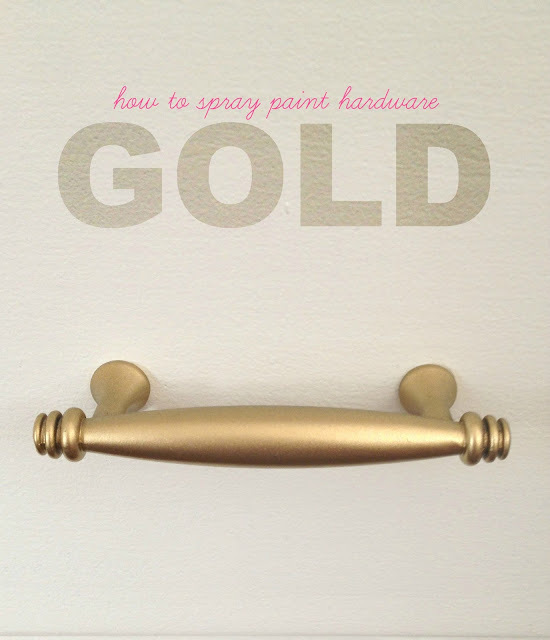 I swooned a bit over your dresser with that amazing golden hardware. And with the striped rug? *Happy sighhhh. * It's love. HA!!! I love that you love my stepladder. Tell Andy ladders are evil and that's all he needs to know. Period. Muah! Totally understand about transitional spaces! My whole house is that way. Great job. Ha! Mine too! Thanks Cyndi! Virginia...your entryway is so classy! 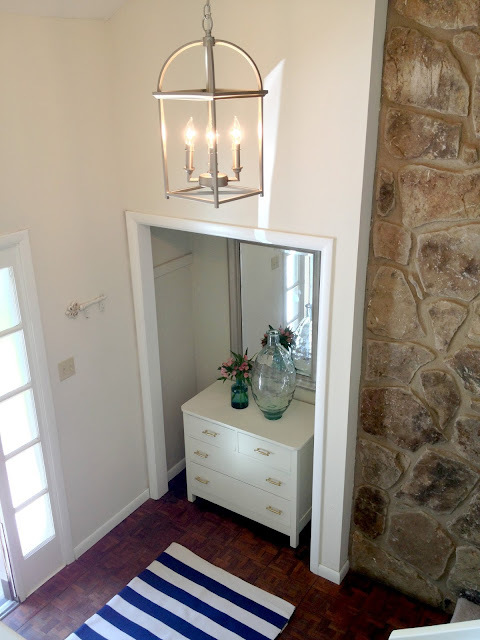 Love the new light fixture...it really enhances the area beautifully! I thoroughly enjoy reading your blog and from the very first time I read it I admired that round, (filagree-type?) Mirror on that stone wall in your entryway...I thought now would be the perfect time to ask about it! You dolled it up somehow...is it wood? Did you whitewash it? So many questions! :p would you mind sharing? Love the nook!! I was thinking of doing this with a closet we have, but I'm not sure if I'll end up missing the hidden storage. Also, regarding your flooring...I have always loved dark wooden floors and was super excited when our new home had them in all the bedrooms. Never in a million years did I think about how much it shows every little dust speck! Drives me nuts! In all fairness we have two dogs, so that doesn't help. I love the look of the floors, but wish they were lighter or a mix of light and dark to somewhat hide dust and pet fur! Great giveaway! And the nook looks awesome! A word on hardwood flooring options: Prefinished hardwoods rock, but make sure whatever you pick out has edges that will meet up flush with the neighboring pieces. We rented a house that had gorgeous prefinished oak floors throughout, but each piece had beveled edges all the way around. There were these horrible grooves in the floor where dirt would collect (that was really hard to remove) from wall to wall every 3 inches over 1500 square feet (nightmare cleaning situation when you have 3 children under the age of 3). Also, please never install hardwoods in a kitchen, bathroom, or laundry room, wood and water don't mix well, and your wonderful new flooring will end up a water-damaged mess in a heartbreakingly short amount of time. Hi, My advice to you is to make sure the flooring is laid in the direction of the door. Perpendicular to the door rather than parallel. As you can see, the flooring in the picture you posted is laid out towards the door which flows with the light. It will really make a difference :) Just a trick I learned during my construction Carpentry schooling. What a great tip!! Thanks Robyn! I also love how painting your mirror also lightened up the rock wall. Looks great! My thoughts on floors: We put in bamboo and I loved them. They held up with our 100lb Lab and 4 year old boy, so that says a lot. That said, I'm not sure if bamboo comes in darker colors. Also, if I were picking something now I would definitely go wide-planked. Not sure if bamboo comes that way either. A comment for the hardwood floors... From past experience... Buy the real deal and have someone install them for you. My husband and I went with pre-fab dark flooring years ago and hated them. They were floating and felt werid. along with the fact you can see every bit of pet hair and other off the floor becuase they were so dark. We now have real oak hardwood floor in a medium color and absolutely love them! completely worth the extra money and the will last so much longer!! it's lookin better and better with each pic! love the nook! This looks great! Dark wood is so pretty but be careful going too dark, it shows every little thing tracked in from outside. I found your blog one night months ago and stayed up late hours into the morning pouring over your posts. I also liked that we seemed to be at the same place in our lives which is rare to find in the blogging community. I've since recently creating my own blog, feel free to check it out! "My bad", "Bug Basket", "So close". HA! So great! How long do you hope/plan to have hardwood floors? Solid wood lasts the longest, can be sanded down multiple times to take out scratches/dings, and can be restained if, say, in 10 years you're over the dark. 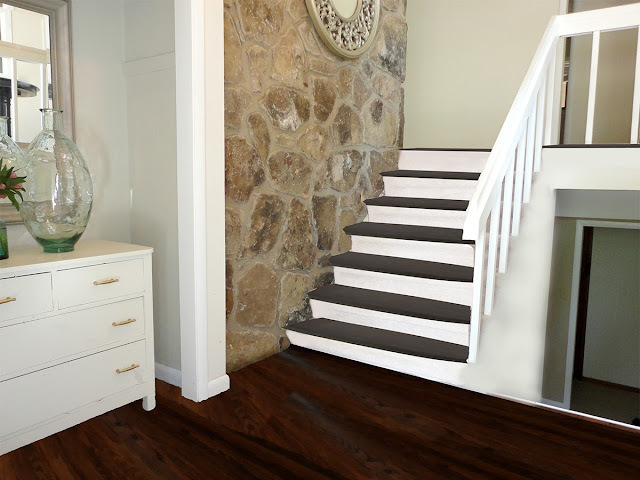 A second, more economical option is engineered wood floors. It's real wood, but only thin veneer layered over a sandwich of other woods for strength. We have these and they're beautiful. Installed the same way as plank tongue & groove hardwood floors. Two knocks on them: can only be resanded a couple times before you hit bottom and can't be refinished. BUT, they're SO much cheaper than real wood we're hoping to swap them out once they feel "done". Wood floors are awesome though. Feel great, look great. Couple things I've lived and learned: you'll be surprised how easily they can scratch / ding. The harder the wood the better. The first scratch will kill you and you will forever lament it. Every ding after that will be shrugged off, "meh". And also be sure to ask the manufacturer about fading-- I was really surprised when our "blond" wood turned into more of a strawberry blond. Good luck! Can't wait for this makeover reveal! It's amazeballs, Virgina... simply amazeballs! P.S. I have to force myself up the ladders over here or it would nevs get done! Have you ever considered painting the stone wall with a white-wash? It might open up the color options for the rest of the room! Hi Virginia! 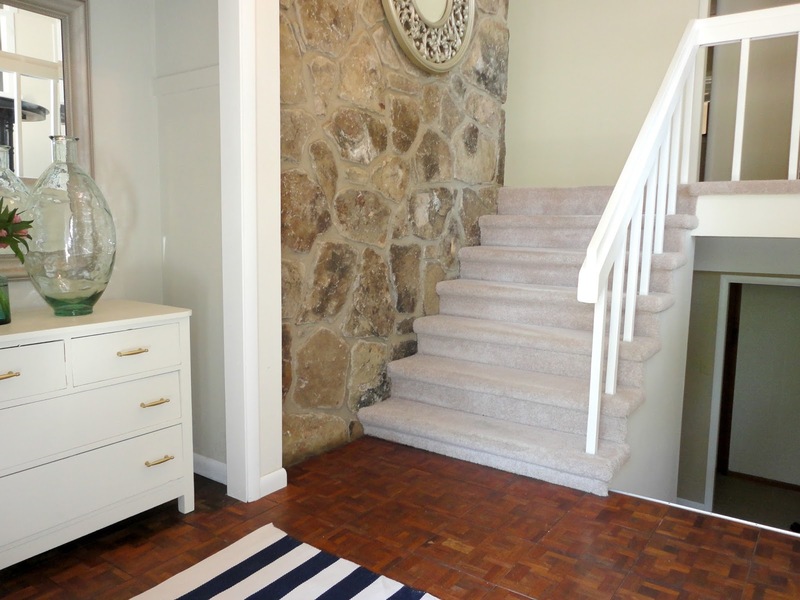 I love both of the flooring colors you're eyeing. The first thing I noticed is that the warmer colored wood brings out the warmer tones of your rock wall, whereas the darker wood brings out the cooler tones. I've been thinking about redoing the floors in my mom's dining room, and I'm definitely headed for veneers! Just the thought of her dog's nails scrambling around on a wood floor to get his ball makes me cringe. And the veneers are oh so wallet friendly. Plus, for me they'll be DIY since there's no glue and not much prep work. Wish I would have done it 5 years ago! I am in love with your round mirror on the rock wall! Where did you get it?